dug up an old one - Lake Houston Fishing! It was a foggy misty morning as i circled the big rig around in the ponderosa . evinrude broke the Erie quietness of the morning as i puttered down the bayou. good fish . 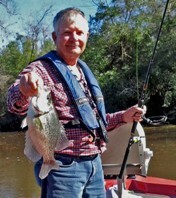 i jerked back and the fish took off to the left through the cypress stumps. make it go off sideways. Hope you enjoyed reading this as much as i did catching it. LOL.